Center Party leader Jüri Ratas paid a part of the price for his planned coalition with the Conservative People’s Party (EKRE) and Isamaa yesterday when recent Tallinn city council chair Mihhail Kõlvart (Center) was elected mayor. Kõlvart received 45 votes, which is more than there are centrists in the city council. This suggests the incoming coalition also seems to be working on the level of the city council. Kõlvart, who took more than 17,000 votes in the March Riigikogu elections and over 24,000 in the 2017 local elections, is the most popular representative of the Russian-speaking community in the Center Party. However, people who voted for him definitely did not expect Kõlvart’s party to form a government with EKRE that has treated Russian-speaking people and Kõlvart himself to more than a few choice words. Postimees has been told that several Russian-speaking member of the city council have received hate mail from voters. Kõlvart is key to explaining to Center’s crucial Russian constituency that such a coalition is necessary and even unavoidable, even if Kõlvart is not sold on it himself. The price of having him communicate that message is the mayor’s chair. This notable step heralds considerable change for how Tallinn is managed. Outgoing Mayor Taavi Aas, set to become Estonia’s economy and infrastructure minister, is first and foremost an executive, tasked with keeping things running smoothly and launching new projects. Mihhail Kõlvart is more of a classic top politician who likes to play politics rather than dealing with streets and pipes. As a top vote magnet, Kõlvart has so far lacked a platform for realizing his political capital in full. He will be given one now. The city and its budget of well over half a billion euros will give him considerable political power and administrative resource, allow him to man dozens of city government, city council and advisory positions with necessary people and build a personal team – people who will work both toward running the city and the mayor’s political goals. In this, Ratas has allowed Kõlvart to climb as high as he can go. Mihhail Kõlvart will definitely become a more independent mayor than Aas, who often long discussed matters with Ratas. Still, it would be wrong to think Kõlvart can do as he pleases and ignore the party. He needs Center as the party, run exclusively by Estonian politicians, is his only guarantee for votes and the position of mayor. 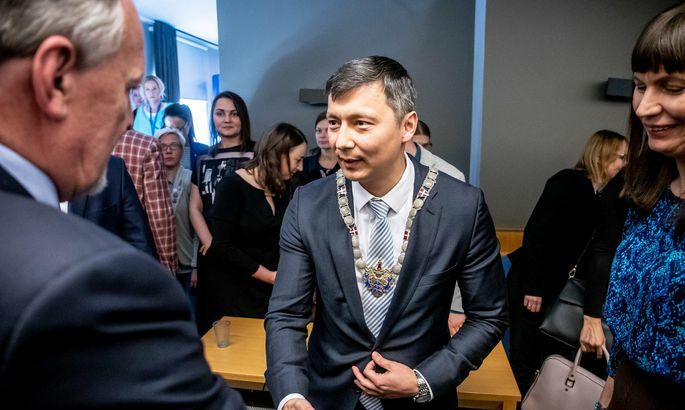 Kõlvart falling out with the party would also cause him to lose touch with around ten Estonian-speaking city council members – enough to cost him the city. Kõlvart is tasked with doing everything in his power to stop the party hemorrhaging Russian voters by the time of local elections in 2021. Virtually no one at the top believes Center will be able to maintain its hegemony in the capital in two years’ time. The trend has been clear for some time. In 2017, Center did not secure its absolute majority until the results from the very last polling station were in. Center will very likely not be able to repeat that narrow feat again. Realistically, Kõlvart has to make sure Center wins the election and gets to form the next coalition in the capital. Provided the government coalition between Center, EKRE and Isamaa holds until 2021, Kõlvart also needs to keep centrists in line in the city council. The party’s already narrow majority after the last local elections was reinforced by offering the Reform Party’s Deniss Boroditš the position of head of the city transport board. Boroditš voted for Kõlvart yesterday, despite the fact he has not joined the Center Party. Raimond Kaljulaid’s decision to leave the party will have to be jotted down as a loss for Center. The hope of the city council opposition – de facto consisting of the Reform Party and the Social Democratic Party today – and Center’s fear is that should EKRE stick to its abrasive rhetoric and voter pressure on Russian-speaking councilmen endure, some of the latter might defect. That would cause Ratas and Kõlvart to forage for support from EKRE and Isamaa that are part of the opposition in Tallinn but share a coalition with Center on the state level. Yesterday’s vote suggests this is already the case as Center does not have the 45 votes Kõlvart needed to be elected. The incoming mayor received four “just in case” votes (and was likely also supported by Edgar Savisaar and Deniss Boroditš) that suggests Center’s board did not have complete confidence in their councilmen. Therefore, Ratas and Kõlvart need one another. Tensions here might translate into considerable policy changes in the so-called grand coalition should national conservative EKRE and Isamaa start demanding things Kõlvart would not like to see. One such thing is Estonian language policy in education. While the coalition agreement cements the recent situation at present, things can change.